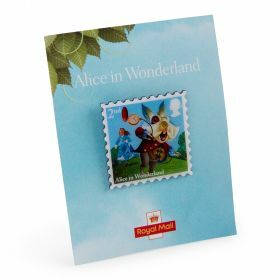 These high quality, collectable Pin Badges are created from the actual stamp artwork and enable you to add no less than five Alice in Wonderland characters to any outfit or lapel. Drink Me 1st Class At the bottom Alice glimpses a charming garden she can see beyond a tiny door she is too big to go through. She finds a bottle of potion with a painted label imploring 'drink me'. Alice drinks, then shrinks, but now is too small to fetch the key for the door she found on a table. She eventually reaches the 'shores' of Wonderland by swimming away through a pool of her tears formed when the Eat Me cakes grew her.